All across Europe, we see growing opposition to immigration. Tough measures imposed by governments are limiting immigration but are not having the same effect on opposition to immigration. Mounting polarization is putting Europe’s democracies as well as European cooperation to the test. I recently visited Warsaw, and then travelled on to Berlin. The capitals of two countries with a common border, but distinct political histories. Poland is Europe’s most homogeneous country. Following World War II, there is almost no ethnic minority population, and immigration has been minimal – with the exception of people from neighbouring countries. Nonetheless, in Warsaw the Law and Justice Party holds power: a party that has mobilized support by opposing immigration, and that is now using its majority in the Sejm (the lower house of the Polish parliament) to weaken democratic control mechanisms. Germany has been asking itself for over 70 years how National Socialism could have come to power. Meanwhile it has implemented what is perhaps Europe’s most generous immigration policy; and today has an ethnically diverse society. In recent elections, the right wing populist Alternative for Germany (AfD) party won 12.6 percent of the votes and for the first time gained seats in the Bundestag. These examples are representative of the general picture: opposition to immigration finds support throughout Europe, regardless of context. Large-scale migration over a short period poses a challenge to any society. The debate about this is delicate. In Norway, the second report by the government-appointed Welfare and Migration Committee (the so-called “Brochmann II Committee”, after its chair) put its finger on the problem: “Insufficient communication about these dilemmas may backfire, but so may one-sided attention.” (NOU 2017: 2, page 170). Here too the situation is very different from country to country. Within Scandinavia, Denmark has had an extremely heated debate about immigration, but our neighbour Sweden has virtually put a lid on all debate about problems relating to immigration. Meanwhile Norway is somewhere in between (although many would suggest closer to Sweden than Denmark). The much-discussed refugee crisis in 2015 led to major political changes. The “crisis” consisted not only of a record number of migrants arriving in Europe, but also brought about the collapse of the systems to receive and manage them, as well as of the political consensus. It became important to limit migration. Drastic measures – such as a border fence in Hungary; patrol vessels in the Aegean Sea; and internment camps in Libya – have had an impact. Countries far from the Mediterranean front-line are shielded from the flow of migrants. Many of these measures are difficult to defend. And more pragmatically – to the extent that the fear is that a large number of new arrivals will further stimulate opposition to immigration, and thus put democracy to the test – a reduction in immigration is not likely to have any immediate effect. My sociologist colleague Lars Mjøset believes that opposition to immigration is the most important popular movement in Scandinavia and Europe in our time (as, for example, in his article in Det norske samfunn). Democracy in Norway has emerged through interaction between the state and popular movements: the agrarian movement; the labour movement; and the women’s movement. These movements went on the offensive, with political programmes that provided a starting point for political compromise within the framework of the nation state. Today’s political movements – the environmental movement; the anti-globalization movement – are defensive, and campaign on issues that require international solutions. This poses a fundamental paradox for the anti-immigration movement, which is overwhelmingly associated with a deep scepticism of supranational solutions in general, and – in a European context – of the EU in particular. We also see growing polarization within Europe’s nation states. Once again, immigration is a central theme, but with opponents having a completely different level of political strength than supporters (despite voluntary actions, mobilization at local level, and organizations campaigning for immigrants’ rights). In Norway, we have long scoffed at “political correctness”, and gradually it has become an established truth that the Norwegian consensus is an evil that suppresses all real political disagreement. Polarization is far more explicit in most European countries than in Norway. But it is not difficult to imagine that in a few years’ time, we will look back to the past and wish that we still had the consensus we see there. This polarization is more obvious among Europe’s other nation states. The euro crisis, which took off in 2009, pitted southern and northern European countries against each other. The Mediterranean countries were badly affected, and Germany took the lead in a rescue operation that involved major cost-cutting in the south, and although there is still a great deal of discontent, the union did not collapse. The migration crisis, however, quickly became a more fundamental threat. Once again, the Mediterranean countries – particularly Greece and Italy – suffered the impact, this time as the principal first EU countries of arrival. But the major fault-line in the EU is between east and west, between “new” and “old” Europe. Christian Joppke argues that the former Eastern Bloc countries never underwent the same human rights revolution as Western Europe. Shielded by Communism, those countries never developed the same norms for tolerating all types of difference, whether sexual, religious, ethnic or something else. Accordingly, Joppke argues that when the Hungarian prime minister, Viktor Orban, declares himself an ‘illiberal Christian nationalist’, he embodies fundamental cultural and political trends that extend far beyond his own country. This is also the background against which several Eastern European countries have opposed the adoption of an EU quota system for refugees. 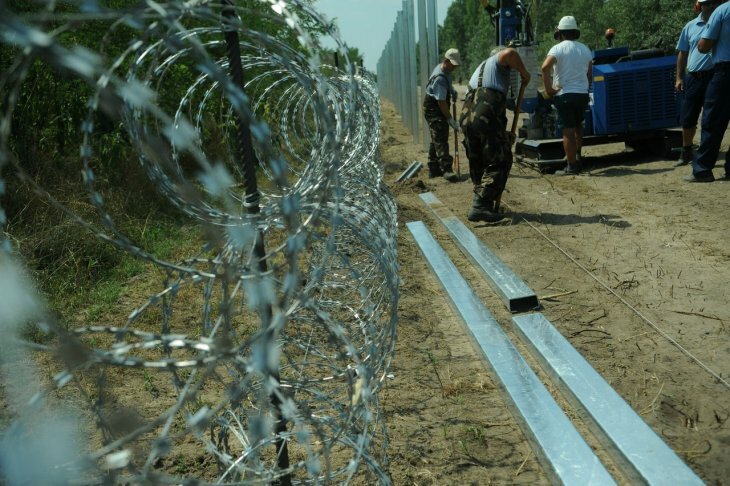 At the same time, Hungary’s border fence is one of the most effective measures for protecting countries in northern and western Europe from new migrants. In the final analysis, Europe’s democracies are being put to the toughest test they have endured for a long time. Anti-immigration movements act to unify forces that are very discontented with existing political systems. Charles Tilly, in his book Democracy, published in 2007, writes about democratization as a process, and thus introduces the possibility of de-democratization. Our hopes must lie in the fact that democracy has always been a battlefield, and has often proved to be at its strongest when under challenge. This text was first published in Norwegian in Bistandsaktuelt 31 Oct 2017: “Et mer polarisert Europa“.